Thus, after dozens of false starts and hundreds of pages, Twain embarked on his “Final (and Right) Plan” for telling the story of his life. His innovative notion - to “talk only about the thing which interests you for the moment” - meant that his thoughts could range freely. The strict instruction that many of these texts remain unpublished for 100 years meant that when they came out, he would be “dead, and unaware, and indifferent” and that he was therefore free to speak his “whole frank mind”. 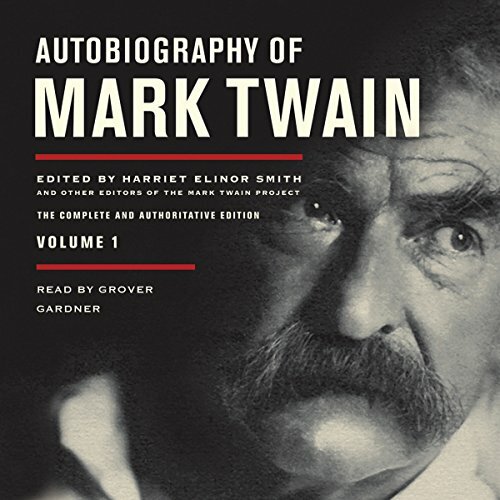 Edited by Harriet Elinor Smith and other editors of the Mark Twain Project. Mark Twain (1835 - 1910) was born Samuel L. Clemens in the town of Florida, Missouri. One of the most popular and influential authors our nation has ever produced, his keen wit and incisive satire earned him praise from both critics and peers. He has been called not only the greatest humorist of his age but the father of American literature. ©2010 2001 by the Mark Twain Foundation. All Rights Reserved. Transcription, reconstruction, and creation of the texts, introduction, notes, and appendixes copyright 2010 by the Regents of the University of California (P)2010 Blackstone Audio, Inc.
At the time I purchased this edition there was only one review on this site and it criticized the book for "endless dribble on the making of autobiography...very boring." Needless to say I was a bit concerned, but I have waited so long for this work to be released I went ahead and ordered. 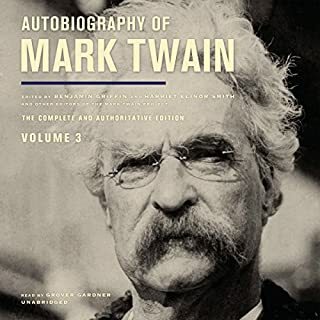 This autobiography is thrilling for people, like me, who are devoted to the works of Samuel Clemens. This is the first volume of his autobiography which Clemens instructed not be published until one hundred years after his death. Yes -- there are long passages of scholarly notes, what the previous reviewer called "endless dribble." This is an important work of history, requiring diverse sets of notes, letters and dictations made by Clemens over many years to be collected and woven together into one work. Clemens undertook to write an autobiography and then had several changes of mind and heart over the years, leaving for posterity an unfinished autobiography and diverse manuscripts needing to be pieced together. This volume has detailed notes on context, primary references and other information important to understanding how the various manuscripts are pieced together. That is why I think the contents ("List of Manuscripts and Dictations") is especially useful for following the audio version, as it allows listeners to have a sense of format, and to skip ahead as needed without being lost in citiations. The chapters that contain Clemen's writing are pure Mark Twain. Here are candid notes about his life, his successes, his failures; candid observations of people he knew -- such as Ulysses S. Grant. I am listening with awe, and with goosebumps. Here is the autobiography that we had to wait a hundred years to read. I'm looking forward to the next volume (understatement). The narrator is a good match for this work. As an English teacher, I like to get Audible books that are entertaining because I am reading, researching, and grading all the time during the school year. I have loved Twain all my life and have even gone to Hannibal to participate in workshops - which were awesome. When I heard the autobiography was being released, I was thrilled. When I started listening to all the acknowledgements, I thought, "How interesting to know who the people and institutions are who contributed to this great work." Then when it began to sound more like an autobiography of those who edited and sweated and argued and agreed over the many processes that go into the manuscript, I thought, "This is not about Twain but about those who put the book together. So it should be called the AUTOBIOGRAPHY OF CONTRIBUTORS TO TWAIN'S AUTOBIOGRAPHY." I cannot pick up a book or an audio book and not give it fair chance, though, so I trudged on. The first fifteen chapters or so are not what I believe Twain had envisioned for his autobiography. I believe that Twain Scholars would love this book and use bits and pieces in university level classes, but I think Twain wanted it to be published without all the credits to the additional contributors. I have finally reached parts that are uninterruped chapters of Twain, but then between the chapters there are always "discussions" or "commentaries" on what went into putting the book together. In a way, I feel tricked by the way this "autobiography" has been marketed because it is not PURE Twain autobiography. It is too "heavy" for continued interest. I am hoping it "lightens up" with the text Twain intended. I may have to put it away until summer but if I had known that it was going to be a compilation of compilations through the decades of those who contributed, I would not have gotten it and wish I had my credit back. I give it three stars because I know scholars would love it and the Twain sections are satiric with some serious sides of Twain. 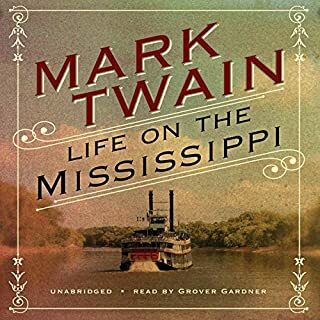 Grover Gardner is one of the two or three best narrators of Twain, and he does an outstanding job on this (sometimes) difficult material. The difficulty isn't because of Twain's writing, or in this case speaking -- he dictated most of this material, and you can "hear" him sometimes backing up and correcting himself. Twain's writing is one of the wonders of the natural world, and he's the only writer who can make me laugh out loud on the subway. The difficulty in this case is the background of the project and Twain's design for an autobiography. The audiobook is basically everything in the printed volume except the footnotes. 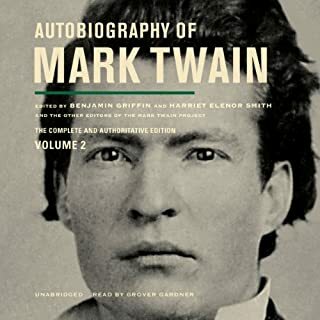 It includes the extensive introduction (how the editors identified the order of the various typescripts), several hours of "false starts" (autobiographical material Twain published elsewhere before settling on this plan), and extensive captions for each section. Gardner's clear and resonant voice keeps everything in perspective, but there's a lot to digest. If you're a Twain fan, you'll be grateful. If you're not, this book wouldn't be your best introduction. It probably helps to have a good grasp of the essentials of Twain's life before going into this one. It's chronological -- not according to Twain's life, but according to the order of dictation. Twain wanted to combine aspects of diary and autobiography into a single scheme, one that left him the ability to jump from one subject to another as the spirit moved him. And it moved him quite a bit. A given day's dictation could cover six or seven different topics, each with Twain's eye for the illuminating detail and the perfect self-deprecating turn of phrase. For diehards like me, it's a feast, a cornucopia, an incredible act of generosity on the part of editors, publishers, and reader. But it does require careful listening. The editors??? long and tedious explanation of the autobiographical material takes up most of the first part of this three-part audiobook. 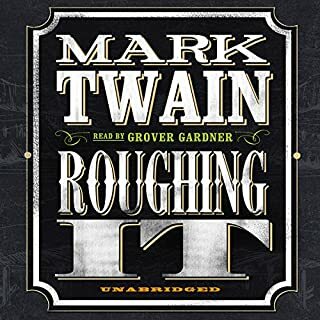 I believe that Mark Twain would have had a good laugh at the pomposity of the editors and their footnotes; unfortunately I found it insufferably boring and a very poor use of audio. If I had been reading a print version I would have skimmed or skipped this beginning all together. I wanted to read Twain?? ?s writing not what all those other folks think I should get out of reading it. A very brief "We got this stuff from lots of different places and times and some of it's literal and some of it isn't. Enjoy," would have been fine with me. Twain does an excellent job of explaining himself. Much of the content isn't Twain -- the book is interrupted with endless extended footnotes and chapter introductions by the editors. The opening "acknowledgments" section itself goes on forever. Some works of literature are best read aloud. This is true of most of Mark Twain's writing. Unfortunately this is not true of most scholarly work. I appreciate the amount of scholarly research that was necessary to assemble the Autobiography of Mark Twain. That doesn't mean I want to listen to it. The narrator commences this work with an introduction that contains detailed descriptions of the various hand written and typed manuscripts and the multiple edit marks. After an hour of this tedium, we are finally treated to some of Mark Twain's writings. This might have been tolerable if they had quit there, but each section of each chapter is introduced with more details about how it was selected and assembled. When I go to a concert, I want to hear music. I know there are musicologists who have studied the intimate details of the compositions. There is great skill that goes into this study, but scholarship is not music. Neither is it literature. I have some advice for editors who insert their scholarship into fine literature. Words written about literature are not literature. There are some people who care about these details, but they are exceedingly few in number. This is what post notes are for. If you ever again feel compelled to contaminate a work of literature with your own composition, go take a nap. Bye and Bye, the compulsion will pass. If it doesn't, find another line of work. This is just too dry, and I am not much interested in the scholarly context. Where's the Twain? What was most disappointing about Mark Twain’s story? Not enough Twain; too much commentary about how the story was put together. Waiting forever for Twain's actual story. No. I liked the narrator, no problem there. I tried listening to this book and it was just too difficult to follow. It didn't seem like an autobiography at all but instead it was a bunch of researchers and historians praising themselves. I know two people who tried reading the book and quit for the same reason. I do not recommend - despite how much you might like Mark Twain. I would have loved to have known him! To have his words put down exactly as he spoke them is awesome. I love the way he thinks and speaks. An honor to know him this way at least. I felt as if I was sitting with Twain! I live in Elmira, NY (home of Livvy, and the place where Twain was buried). Even before I moved here I was fascinated by Twain's writing and my interest has only increased over the years. I vaguely knew that he had left some writings for future publication and I was thrilled when I saw that Audible had it. 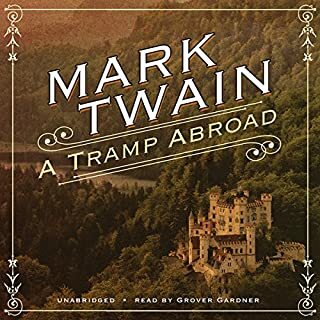 Have to admit that the foreword was a bit discouraging, but once past that it just got better and better, until by the end I truly felt that I was having tea with Samuel Clemens and listening to his wonderful stories. I could almost smell the cigar smoke! Great job -- can't wait for the next volume! Sadly I think that audio is the wrong medium for this book. I found it incredibly frustrating that a large portion of the first part was spent describing how the autobiography was put together and how many times he started it and how it was done ie dictated. There was such minutiae that I was thoroughly bored and just wanted to get on and listen to the book. In fact I think it said somewhere that the introduction was something like 200 pages long. If I had had the book in my hands I could have skipped those pages and gone straight to the autobiography itself. It would have been better to have the academic analysis as a separate item at the end. Similarly there are interjections by the editor that interrupt the flow of the book. I really wasn't interested in the fact that a certain date was considered to be wrong and the incident described was thought to have taken place six months earlier than the author indicated. It would have been better to have a different voice reading those to differentiate between them and the author's words. Having said that the actual autobiography is very entertaining but I think I will buy the book if I want to 'read' it again. It has 2h 15 of talk about writing the book at the start, Frustrating in audio book form as it is hard to know where to skip to. I must admit I looked forward to this but gave up on it after a couple of hours. It’s not really an autobiography, it’s more an academic commentary on an autobiography. It has short stretches of the autobiography itself, interspersed with long stretches on analysis and lists of individuals who carried out the project. Very frustrating and slightly misleading to call it an autobiography. 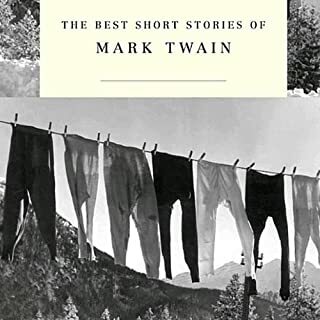 The most intriguing aspect of this book is that Twain pulls you back to the mid-1800's and provides a picture into what society was like then, what people were thinking about, how they interacted, and the major issues of the day and their impact on his own life. The reason I threw out only two stars is that I just haven't gotten through it - I continue to receive monthly credits then use those credits on audiobooks that just interest me more - I have it on my iPhone (as a backup) still but, to tell you the truth, I never seem to be in the mood to push play on it. His amusing and equally entertaining accounts of the momentous and seemingly inconsequential make him alive today in this splendidly narrated autobiography. Way ahead of his time in his methods and subject matter. He states it his right to recall whatever is his in his mind at any given time and to talk about what interests him 'on the fly' and this predates what we now know as 'blogging'. he dictated most of this from the comfort of his bed, raising laziness to a sublimely effective level. The volume 'heats up' in entertainment towards the end in my mind. His uncanny recounting of his young daughter Susy's innocent sayings and doings as a young child -spoken after her death - are recalled unsentimentally and with such clarity that they can't fail to move the listener. He was as equally as outspoken as Einstein on political matters and many of his observations on the corporate world of presidents and banks ring true today too. His anecdotes of the irreverent are irrepressible and joyous. Thank you to the foundation for their marvellous collation of these writings. it's a must read or in this Audible form - 'A must listen-to' !